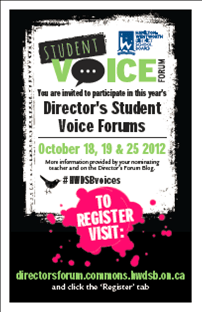 This past October (18th, 19th, and 25th), we held the second annual Director’s Student Voice Forum in @HWDSB. As last year, the forums were held one per cluster, on three different days, with approximately 30 students invited to attend from each of our 18 secondary schools in the system (estimated attendance: +/- 200 students per forum). The students were selected and invited at the school level with an emphasis that the sample be representative of the unique culture and diversity of the school as a whole. As we always want to hear from a diverse cross-section of students, we also prepared to have translated materials and interpreters on site should our multi-lingual / newcomer students require support in this way. We also asked for a range of grade 9 -12 and boys and girls so as to have a balance of participants in this regard. Students also needed to be prepared to speak and share their thoughts and feelings with the larger group on site at the forums. For those physically invited, a variety of opportunities to contribute were provided in the form of a blended learning environment. As well, recognizing that we would only be serving 3.5% of our secondary student population (our 2012 secondary FTE was listed as 17,039 in the 2012 Director’s Report) all content and questions were curated and made available on the Director’s Student Voice Forum Blog, thus ensuring access for all students either synchronously with the students at the forums or asynchronously during another time or from home. All links were shortened using bit.ly, packaged into a bundle, and flyers with corresponding QR codes were sent to all schools for posting in classrooms, hallways and the like so that students could access the blog and have their say with their own devices. I wrote extensively on the process, rationale and framework for the Director’s Student Voice Forum last year, so will not repeat that material here (Read “Listening to Our Students: Voice + Choice = Engagement“) but do want to highlight the focus for this past year’s forums as well as additions and improvements we added to the model based on reflection of the previous year’s events. Last year, we asked Student Success leads and principals to invite students personally and to poll them as to what they wanted to talk about, discuss, examine at the Forum itself. This year’s forum had a slightly different focus. Hamilton-Wentworth District School Board (HWDSB) has undertaken an extensive secondary program consultation process. Step one was the accommodation review process. Throughout, we heard from our community and the Board made decisions on school closures. In 2016, we will have 13 high schools instead of 18. Closing underused schools will allow us to renew remaining school buildings, balance school populations and the variety of course selections, and will make every HWDSB school a great school. But what exactly is a “Great School”? This is exactly what we wanted our students to help us with. In his post, “Students will inform our program strategy!” Dr. John Malloy announced that our students would help to inform our program strategy moving forward. Every secondary school in HWDSB is a great school. Students will have enhanced program choices in their local school. Equitable access will be provided to specific programs. 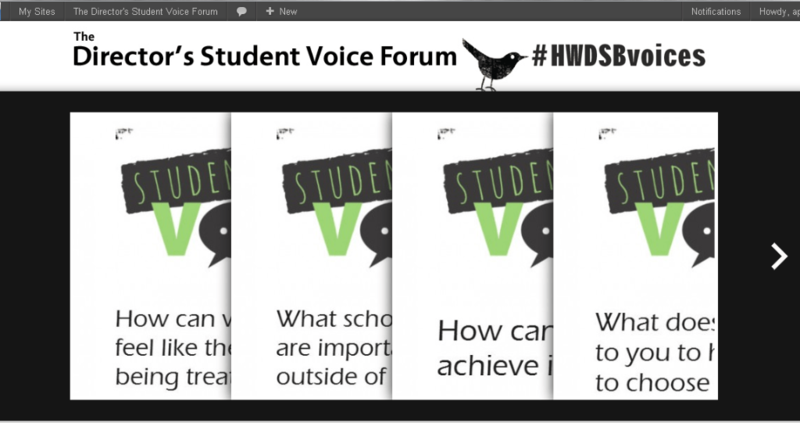 Each topic was added to the redesigned Director’s Student Voice Forum blog and assigned a hashtag for use on Twitter should students choose to participate using that social media tool (a first for us this year). 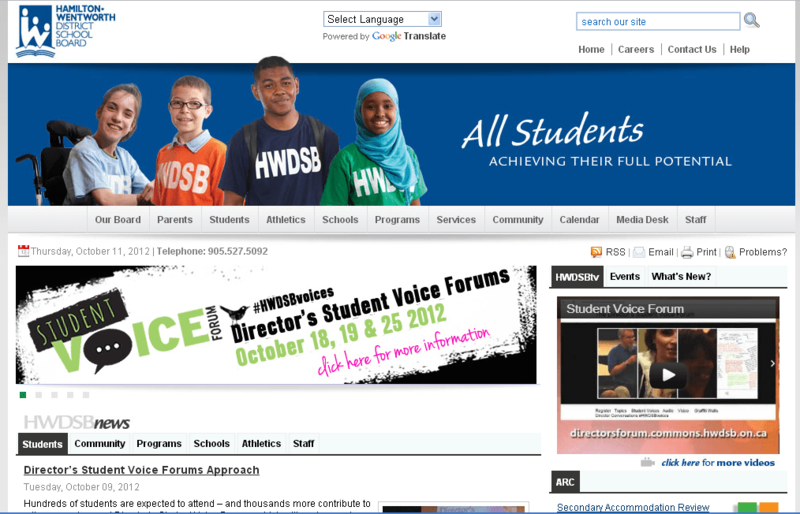 The new banner of the blog prominently features the main hashtag #HWDSBvoices and an official logo for the forum to enhance its visibility and branding. The concept behind the hashtag is that is could be used to curate any and all voices in @HWDSB – student, staff, and parent – as identified as priorities in our Annual Operating plan under Knowing Our Students, Knowing Our Staff, and Knowing Our Parents respectively As such we did not name it specifically for the student voice forum. Starting on October 8th nominated students received a survey from eBest (our research department) by email for them to complete. Responses gathered from this survey helped to determine the hot topics (generated by students) for the day. These topics were used as a springboard for discussion and to help inform the questions highlighted above. Leading up to the day, students were directed to the ‘How to Participate‘ on the blog so that they could get a feel of the blended learning environment, the many ways they could participate, and the many tools they could use to do so. The stage was set – we advertised the forums on the HWDSB website and on HWDSBtv – coinciding with the distribution of the survey to invited students. As the continuing theme of the Director’s Student Voice Forum is “Your Voice, Your Way”, we really encourage students to use whatever device they prefer or carry on their person (cellphone, smartphone, iPod Touch, iPhone, Blackberry, iPad, etc.) to contribute (laptops, iPads, graffiti walls and the like are available on site as well). Their phones are powerful computers and they could contribute on Twitter and the blog using the Twitter and WordPress apps. We asked them to download these apps before Forum day onto their particular device(s). How to post to the Director’s Forum blog from an iOS device. Portable Wireless Access Point (WAP) – wifi was a bit of an issue last year. If we were going to leverage personal devices, thus adding to the consumption of the wifi signal, a boost was going to be necessary! To ease access to the blog, and for students to express themselves without impediment, we no longer require students to login to comment (this slowed the process down tremendously last year). Instead, students reply as guests to the blog. This increased the frequency of student comments in this medium exponentially over the previous year. I turned off Avatar display for this blog so that participants did not appear as phantom faces (since they weren’t logging in to contribute). VoiceThread implemented and embedded in each blog topic to capture audio and video voices surrounding any given topic This was a vast improvement from the previous year where we utilized Audacity as our podcasting software. Whereas Audacity is an amazing tool, curating, editing, and exporting the clips to .mp3 was taxing and extremely time consuming (especially since it was just me doing it!). Leveraging VoiceThread allowed for the voices to be automatically uploaded and accessible through the embed without extra management. This was not without some difficulty, however, as the VoiceThread embed is Flash based and, as such, does not appear through Safari on an iPad. To access, we had to add a link to the VoiceThread file on line. Touching this link triggered the VoiceThread app (which then needed to be downloaded from iTunes if not already installed). We made tweaks to this model in subsequent forums which I will be reflecting on shortly. All Graffiti wall images were inserted as a gallery per topic rather than as separate posts. This streamlined each topic and made all modes of communication available in one place. What this did sacrifice, however, was the ability to tag each individual comment left by students. This, too, however, was immensely time consuming. As our topics were focused on the program strategy this year, it made more sense to curate everything together. The result was a cleaner, more accessible product for the user. What does the Director’s Student Voice Forum Look Like, Sound Like, and Feel like? As a blended learning environment, there are many stations, tools, and mediums for communication throughout the room. Some students can be seen very animated and engrossed in conversation with their peers from their own school and those from across the system within their cluster. Others can be seen working quietly and independently at laptops diligently answering the questions as posted on the blog. Some students can be seen having discussion individually or in groups, and recording those conversations for others to hear and comment on using iPads or their own devices. Others still can be seen making video blogs or creating dramatizations The goal for the day is for students to actively contribute and express their voice – HOW they accomplish that IS UP TO THEM. For those more accustomed to quiet, ordered and formalized rotations the forums feel a bit chaotic, a bit disorganized, lacking order. 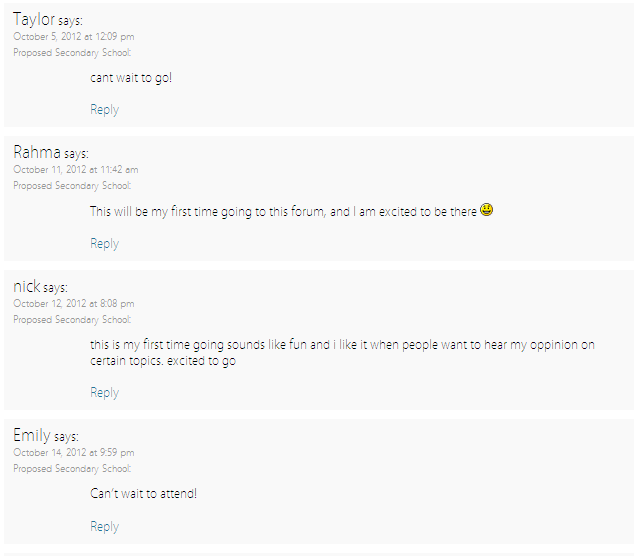 On the contrary, the forums are designed so as engage students in a variety of different ways and to retain that engagement for the duration of the event (about 45 minutes is showing itself as ideal). With a variety of tools at hand, a series of co-created topics, and the opportunity to explore topics of interest on their own time the students explore more readily. The environment is more inquiry based than task driven. Not every student is able to use their personal devices in their day-to-day learning. For some this was a first. Whereas the students responded readily and quite positively not all teachers were entirely comfortable with opening student voice up so broadly and globally. Capturing the QR Codes to Access the Blog. Modelling the tools, however, in forums such as this shows everyone how the tools can be used contextually and productively for learning. Learning is messy – and learning entails making mistakes. If a student was to err in judgement with a tweet it falls upon us to enact on the teachable moment and support the student to use the tool responsibly and to retain the positive nature of their digital footprint. Silliness is bound to happen just as it does in any classroom. The classroom clowns just seem a little louder in digital social spaces. For the record, there have been no instances of drastically inappropriate behaviour in any of these forums. We experienced HUGE engagement this year over the three days of the Forum with digital tools and social media in combination with conversation and brainstorming on the Graffiti Walls. A Truly blended experience with a BYOD flare! There were 2, 179 visits to the Director’s Forum Blog, and 650+ tweets over the span of the Student Voice Forums from Oct. 18th to the 25th, thus proving the power of social media and growing evidence for the rationale for students to be allowed to use their devices for learning and engage in their own way. We noticed that students were interested in slightly different topics depending on the cluster they represented as well. Equity and Engagement topped topics on the blog on the 18th (South Cluster) followed by Great Schools, Programs, and Achievement. Equity and Achievement topped topics on blog on the 19th (West Cluster) followed by Program, Achievement, and Great Schools. Engagement and Great Schools topped topics on the 25th (North Cluster) followed by Equity, the Open Forum, and Programs. The QR Code interaction also demonstrated a difference in priority of topics between the clusters. Total QR Code clicks is 278. Here are the digests of the three days worth of 650+ Tweets. I also added some anecdotal observations and explanations where it fit. One neat thing happened when a class at Westdale started chiming in with the tweets of other students and adding their voice from afar – so cool! We were also trending all three days in Hamilton on Twitter. As mentioned, this year, I used bit.ly to shorten the topic URLs on the Director’s Forum blog and generated QR Codes for each one. These QR Codes were put on flyers for each topic and hung throughout the Forum area at the school for students to comment with the use of their own camera enabled smart phones. These flyers were also sent out to the schools throughout the system so that those students not present at the forums could participate from afar at their school or from home later in the day. This effort proved to be quite successful for an initial implementation. In closing, a positive school climate is one in which individuals are trusted, respected and involved, where there is collaboration, high expectations, mutual trust, caring, and support for all individuals and their diverse learning. At the Student Voice Forums, students have choice, voice and identity, and can advocate for their own learning, making connections to their experiences, values, culture and interests. The model and framework of the Forums mirror blended learning environments that are instrumented instructional spaces enabling effective instruction and tiered intervention to meet the individual needs of all of all learners. Throughout the past two years, engaging students in voice expression forums have become more and more prevalent and a pivotal piece of HWDSB culture as part of the Annual Operating Plan and Strategic Directions. As we move forward, local student voice forums are being developed to inform school self-assessment and school improvement planning. The future in HWDSB is exciting in this regard and our students are helping us to make it happen. The following is an article regarding this past year’s forum as published in the Oct. 12th, 2012 edition of the HWDSB Virtual Blackboard. An epic blog post for an epic event. What an incredible machine you have created in the Student Voice Forums. The time you’ve spent making this hum for our students cannot be counted in hours, but should be quantified by larger units of days. I tip my hat. Thanks so much for the comment, Jared. The student voice framework we have been using, the enhancements added this year, and the ability to curate all of it into a collaborative space such as the Commons has been a perfect mix of face-to-face and digital interactions.